Health Mark Pro Max Inversion Table - 600 lbs, up to 6'6"
The Health Mark Pro Max inversion table is one of the strongest inversion tables around and has a very sturdy 600 lbs weight capacity! If you want to be sure that the inversion table you are getting is as strong and sturdy as it can be, the Pro Max table is probably the best choice for you. Especially since most other inversion tables have a recommended weight capacity of 300 lbs! The Health Mark Pro Max inversion table features 25 height settings to accommodate a range of users up to 6 ft 6″ in height. Note* On visiting the retailer you will see the seller states in the FAQ’s this inversion table is suitable for anyone up to 6 ft 11″ in height. However, since the product description states 6 ft 6″ it is probably best to treat this as the actual maximum height this table can accommodate. If you do need a table that is suitable for those over 6 ft 6″, the Health Gear ITM 7.5 may be a safer choice as it has a height range of 5 ft 1″ to 7 ft. It also has a 400 lbs weight capacity. As with many inversion tables this model features a comfortable padded backrest. Unlike many inversion tables however, the Health Mark Pro Max inversion table features a face cradle that is very similar to those found on massage tables. This means that the inversion table can be used face down should you prefer. You can of course still use it in the conventional manner also (laying on the table on your back with your face upwards). So what are the benefits to this feature? One benefit is that you could potentially use this inversion table as a massage table, or receive a massage while resting on the table. Some far better benefits however, are the range of exercises and stretches that can be performed when you are inverting face down. The face down position is particularity useful for performing back hyper extensions and exercises that work the lower back muscles. When used in the more conventional “face up” manner you can perform exercises to work more on the abs area. Note* We are unfortunately unable to show images of this feature in use, however these can be viewed on visiting the retailer. We would recommend you take a look at these as they really show what is possible on a table that features the face down position option. Due to the design of the Health Mark Pro Max inversion table it has many features you will not find on other inversion tables. As you can see in images of the table it features very long circular side handles, which are a lot longer than the handles on most inversion tables. The side handles cover the whole inversion area making them a great help when it comes to returning to the upright position. This makes them a great safety feature to have and a perfect addition for those who are less confident with the whole inversion process. The side handles also feature 5 pairs of extruding hooks which can be used for limiting the inversion angle. If you do not wish to invert fully upon the table you can place the limitation bar on either set of the side handle hooks to stop the table from going too far back. This again is an excellent addition for those who may be new to inversion or for those who feel uncomfortable when inverting fully. As with all inversion tables the angle limitation system is optional, and 180 degree inversion is possible when the restriction bar is not in place. As we have mentioned numerous times on this site, having a long ankle lock lever is a very nice addition for an inversion table. The long lever on this model ensures you do not have to bend too far over when securing your ankles. This reduces the chances of straining your back muscles. The dual ankle rollers comfortably cushion your ankles in place and provide equally good comfort whether you use the table front ways or when laying on your back. This inversion table also features a 3rd padded roller to support your thighs and knees to add extra support and comfort. This again is a feature that is unique to the Health Mark Pro Max model. Is the Health Mark Pro Max Inversion table a good investment? If you could do with a bit of extra weight capacity this inversion table is hands down one of the best available. As mentioned earlier, most inversion tables weight capacities do not come close to this inversion table, since it can hold up to twice as much weight as most other tables. While the high weight capacity is certainly one excellent reason to choose the Max Pro inversion table, it has a lot more to offer. There are so many things that make this heavy duty 600 lbs weight capacity inversion table stand out as a very unique piece of kit. The fact that you can use the table face down is an excellent feature which opens lots of stretching and exercise possibilities. Plus the extra long handles and unique angle limitation system are also great additions. The one downside (to some) may be the price of this inversion table. Although it can safely hold twice as much weight as other inversion tables, it is also twice the price of many on the market! 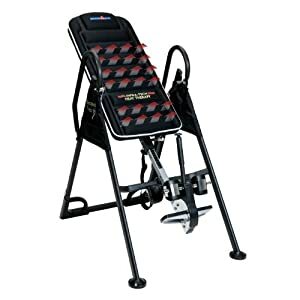 However, its high cost hasn’t put many off it and as you can see in the buyer reviews (in the next tab) many love this inversion table, it is especially popular with buyers who weigh over 300 lbs. 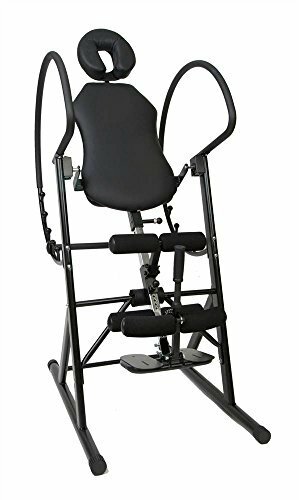 As many reviewers have stated, if you are looking for a very heavy duty inversion table this one is unlikely to disappoint. 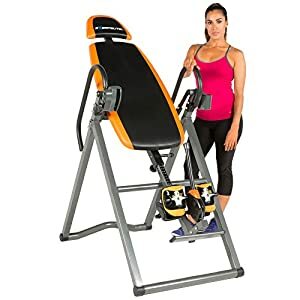 It has a great design and some outstanding features that make it a very good choice of inversion table, whether you need the extra weight capacity or not.